See you on the fairways! Join us at Blue Springs Golf Club for our annual TELUS Swing for a Cure tournament on Thursday September 20, 2018 supporting the Breast Cancer Cause at the Canadian Cancer Society. Your mom, wife, sister, daughter or friend? 1 in 9 Canadian women is expected to develop breast cancer in their lifetime. Whatever the reason for your inspiration, we welcome you to join our fight to end breast cancer forever. 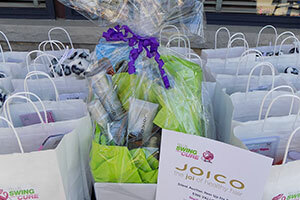 Last year we again held our TELUS Swing for a Cure at the beautiful Blue Springs golf club. The sun was shining, the axes were throwing and the funds were flowing! Thanks to everyone’s generous support we surpassed our donation goal and raised $26,000 for the Breast Cancer Cause at the Canadian Cancer Society. I want to thank my generous friends for helping to donate almost $150,000 to the fight against breast cancer.